The best in Australian design for home accents, interior design and garden decor. Marc Harrison began his creative career as a boat builder before studying interior design at the Queensland College of Art, hands on and experimenting with materials from the start. He gained valuable industry experience with a well-regarded furniture design company before starting his own design studio and label, ANTworks, in 1993. 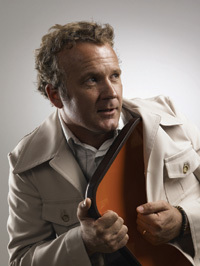 Marc received funding from Arts Queensland in 2000, to pursue a project with the manufacturing sector to explore the potential impact of the artist-designer and develop uniquely Australian design concepts. The idea for the Husque compound grew out of this venture – recycling the by-product (shell) of the macadamia nut (a primary agricultural product) to create an innovative, distinctively Australian material based on existing resources. Inspired by the composition and appearance of 1930s bakelite, Marc worked to perfect his formula for a dense mouldable material well- suited to furniture and product applications. Armed with his original compound of milled macadamia shells and polymer, Marc established the Husque business with architect and artist Paul Fairweather and started manufacturing the first bowls in 2003. The team continues to develop and experiment with the Husque material and its potential uses within design ware and architecture. Harrison’s products have been featured in several international design publications, including the ‘2007 International Design Year Book’. He has exhibited across Australia and internationally in Seoul, Bangkok, Berlin, Milan, Tokyo, Singapore and Shanghai.